Touka is a ghoul successfully posing as a human and working as a waitress at a cafe which serves as a gathering place for other ghouls, as well as a food resource. 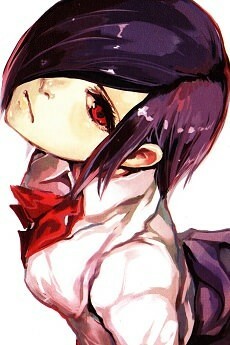 She saves Kaneki's life at one point and acts as a reluctant guide to him and his adaptation to the ghoul society. She doesn't like Kaneki much and has no qualms about expressing her dislike for him. She is very serious, tough and hard-working, trying to keep their district as safe for ghouls and humans as possible. Her powers and strength are also quite great and she makes for a formidable opponent.